KUALA LUMPUR: The supply of the new fuel, biodiesel or B5 will be introduced nationwide earliest in 2013, taking into account companies’ time frame to build the blending facilities accurately, says Plantation Industries and Commodities Minister Tan Sri Bernard Dompok. On June 1, Malaysia implemented its mandatory B5 biodiesel programme (blending five per cent palm methyl ester with 95 per cent fossil fuel) starting with the central region covering Putrajaya, Malacca, Negeri Sembilan, Kuala Lumpur and Selangor. Currently, the ministry together with MPOB are looking into the plan to expand the B5 programme nationwide including industry sectors. “The B5 programme will give positive impact to Malaysia’s oil palm industry, mainly in stabilising demand and price, besides lifting the country’s image at the international level,” he told reporters after launching the use of B5 programme for the central region level, Kuala Lumpur, here today. The government would continue to keep the price at RM1.80 per litre, the same cost as regular diesel and absorb the differences, he added. 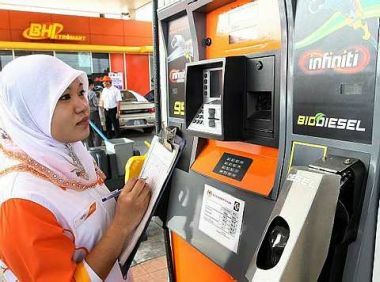 Dompok stated the roll out of B5 in Kuala Lumpur would involve B5 supply by 247 petrol stations, and about 890 tonnes or 1.03 million litre palm oil biodiesel would be used per month. “This would contribute to saving close to 12.4 million litre fossil diesel per year in Kuala Lumpur,” he explained. The government through the Malaysian Palm Oil Board has allocated RM43.1 million for the construction of B5 biodiesel in-line blending facilities.